The actions taken by the police against the protesters and journalists in Ferguson (a suburb of St. Louis, USA) during the weeks-long mass demonstrations caused by the death of Michael Brown, an African American teenager who was shot by the police officer Darren Wilson on August 9, 2014, caused an outrage from the global community. According to the official story, Michael Brown was fatally wounded during an altercation with the police, during which he tried to wrestle a gun out of the officer’s hands. However, according to the friend of the murdered teenager, the police initiated the conflict, and Brown was killed trying to run away. Michael Brown’s murder caused a public outcry amongst the local residens, most of whom are African American themselves. Many people organized peaceful nightly protests that later turned into violent clashes with the law enforcement forces. The media reported that the crowds were being dispersed by SWAT teams that threatened the press and the local residents with armed guns and acted in a very aggressive manner, detaining the protesters and the journalists at will. According to the firsthand witnesses, the police used rubber bullets, tear gas, flashbangs and long range acoustic devices. “Tear gas, rubber bullets, and assault weapons; free speech zones, gags, and press pens: this is the arsenal of the police state. The message was clear: the public is the enemy. And as we the people started getting that message, Ferguson starting working harder to shoot the messengers,” he writes. Dunja Mijatović, OSCE Representative on Freedom of the Media, also addressed the US authorities with criticism of police actions against the journalists who were covering the events. “The right of media to cover public protests must be taken into account when law enforcement officials are maintaining public order. Journalists should not be intimidated by police,” she stressed. Amnesty International also attacked the law enforcement forces, urging the US government to conduct a thorough investigation of the Ferguson events and review the procedures and policies concerning the use of force and the policing of protests. “Police cannot use unnecessary or excessive force – period,” says the statement published on the organization website. Moreover, the human rights activists think the Ferguson events show that the racial problem is still not over in the United States. Among them is Maria McFarland, Deputy US Program Director at Human Rights Watch. “While progress has been made on some fronts, there is racial discrimination in many areas in the US, particularly in the US criminal justice system. African Americans are understandably unhappy about their treatment by the police,” she said in an interview to “PenzaNews” agency. According to the expert, the policemen engaged in several actions that violated the protesters’ rights and international standards on use of force. “In several instances, police engaged in intimidating and threatening actions that were unnecessary and violated protesters’ rights. They also arbitrarily detained journalists,” the human rights activist emphasized. From her point of view, all the cases of excessive use of force require thorough, independent and detailed investigation. “Accountability is a crucial aspect to ensuring that human rights abuses – including police brutality – end,” Maria McFarland stated, adding that those guilty of killing Michael Brown and other victims of lethal firearms abuse must be brought to justice. At the same time, Adolphus Pruitt, President of the St. Louis National Association for the Advancement of Colored People, stressed the fact that the Ferguson events started an international debate on the social problems in the American society. “At this point of time, the conversation exists, it exists locally, it exists nationwide, it exists internationally,” he said. In his opinion, the way to disperse the protests used by the law enforcement forces was poorly-chosen. “I think the police had the ability to try to use a number of other tactics to try to dispel the crowd and try to reason with them, but the approach they used I did not agree with,” the expert explained. From his point of view, the police actions had no justification and went against the constitutional rights of the press and the protesters. “When we use or think we have to use such tactics in order to police our citizens, then we have given up on the very foundation that this country was built on,” Adolphus Pruitt stressed. According to him, the African American population no longer wants to endure constant violations of their rights and sees the recent events as a demonstration of the current state of racial relationships in the US. “I think that what occurred in Ferguson, Missouri, can occur anywhere in this country, where you have a large African-American population and it consistently has excessive number of encounters with police, whether legitimate or illegitimate,” the human rights activist said. At the same time, Gene Policinski, chief operating officer of the Newseum institute, pointed out that the racial tolerance situation in America underwent radical changes throughout the last half a century. “We made great progress for the last 50 years, but are still grappling with the issues of ethnicity and race,” the expert admitted. “On the other hand, we do know there was looting, we do know there was some violence: in fact, some of the protesters complained in the later days of protest that people who were bent on violence hijacked some of those evening nighttime peaceful protests,” Gene Policinski clarified, adding that the law enforcement forces still had no reasons to threaten and endanger the lives of the unarmed citizens. At the same time, he highlighted several distinct features of this movement, especially the active use of Internet and social networks, which facilitated spreading the word about the situation. According to the journalist, a particularly notable part of the Internet protest involved the slice-of-life photos of Michael Brown that presented a sharp contrast to a common image of a criminal and a wrongdoer created by the police forces. Also, he mentioned a group photo of several dozens of Harvard University African American students with their hands up in support of the protesters. The photo became viral in the English-speaking Web. “I found those two protests, particularly nationwide and globally, to be extremely effective,” Gene Policinsky said. Speaking of the violations against the press in Ferguson, the expert pointed out that the demonstrations were dispersed using the same tactics as many protests on international conferences: after surrounding the territory, the law enforcement forces swept up everybody in it, at the same time actively interfering with the press covering the events, which goes against the fundamental principles of US democracy. At the same time, Andrei Fursov, historian and reporter, compared the police actions with the dispersal of Occupy Wall Street movement, and noted that numerous detentions of journalists are hinting towards law and human rights violations that took place during the clashes with the protesters. “It is a typical and very rough behavior of the American police,” he stressed. In his opinion, the modern American democracy is only a myth designed to cover up the exploitation of the majority by the upper class that has replaced the racial discrimination in the modern world. “There are still very serious racial problems in the US. However, the problem is not just in them, but also in the class relations. If you compare the earnings and the division of labor, you will see that African and Hispanic Americans are on the lower levels of the social pyramid. The lower class is the first to suffer from the fall of the American economy, and the people in the lower class are mostly non-white,” he explained, adding that such kind of commotion will only grow in the future. In her turn, Yvonne Bangert, Head of the Indigenous People department of the Society for Threatened Peoples, noted that even the officials of the state of Missouri and the US government found the actions of the local police unjustified. “Without question, basic human rights like the right to freedom of assembly were violated,” the human rights activist stressed, adding that many witnesses compared the clashes with the police to the times of civil war. In her opinion, the fact that law enforcement forces acted against the press only proves the gravity of the violations in question. “At least 11 journalists have been briefly detained and released without charge while covering the protests, according to a report published by the Inter American Commission on Human Rights. Other journalists reported about being threatened by the police and hit with rubber bullets and tear gas. This happened in violation of the freedom of the press and is symptomatic for any authority who wants to cover up its actions,” the expert said. In conclusion, Yvonne Bangert expressed hope that the investigation will be quick, thorough and independent, but regretfully mentioned that the Ferguson events are not the first case of lethal force abuse by police against the African Americans. However, according to her, this is the first such case that received such coverage in the media, and the White House must pay great attention to this fact. “The election of an Afro-American person as president of the United States is an important step towards a new and better relationship between all Americans of all races, but the USA will still have a long way to go,” the expert summed up. Michael Brown, 18, was killed on August 9, 2014, at about 12.00. The unarmed teenager and his friend were stopped by the police, who suspected them of robbing a store. According to the official line, Michael Brown was shot trying to wrestle the gun out of an officer’s hands. However, the witnesses claim that the African American boy was killed when he was trying to run away from the police. The day after the incident, August 10, saw the first protests in Ferguson, which grew into clashes with the police when the night approached. On August 12, Barack Obama, the President of the United States, made an official statement, calling the death of Michael Brown a tragedy and promising a non-biased investigation of the case. On August 15, the public learned the name of the police officer who shot Michael Brown – Darren Wilson, who was later temporarily suspended from his job. On August 16, Jay Nixon, governor of the state of Missouri, imposed a curfew in Ferguson. On August 18, the state authorities made the decision to send the US National Guard to the city. On the same day, the media published the results of Michael Brown’s autopsy: according to them, the teenager was shot six times, including twice in the head. 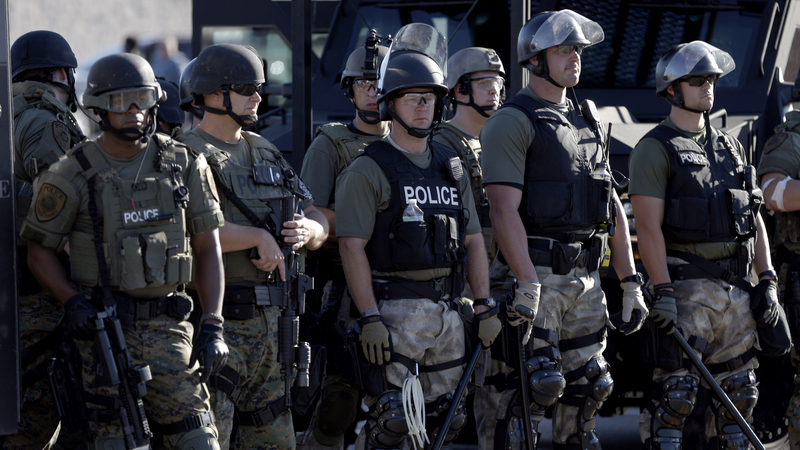 On August 21, the authorities decided to withdraw the National Guard from Ferguson. Michael Brown’s funeral took place on August 25. More than 4 500 people attended the ceremony, including activists, celebrities and three White House delegates.